And sent His Son to be the Atoning Sacrifice for our sins. God lives in us, and His Love is perfected in us. Love love your cake recipe, plan to do it today, yes , I am 69 and loving life now with the 4 kids and 14 grands . Try to help where I can. Love to cook , was raised on a farm and my mom of 93 , in June, showed all of us 5 kids how to cook. She is with me some on visits. So glad u shared your faith in Christ. He is our savior, “No one comes unto the Father but through Me”, Christ said. Thanks for sharing your story with me. I loved hearing about your family. Yes, my faith is very important to me. I hope you enjoy the cake! Love reading your blog Tammy! Makes me want to blog & cook & eat! What a blessing it’s been for me to be in BSF with you these past 2 years, you’ve taught me a lot through your responses in class. Thank you, Angela. I feel the same way about you. I would love to have you in my class next year. We’d have the best conversation! If I’ve made you want to “blog & cook & eat” then I’ve achieved one of my goals in started this blog. You should do it! I can help you get your blog up and running if you need it, so don’t hesitate call. Thank you so much! It’s been a pleasure getting to know you too. I’m glad you dropped by! Amen, amen, sister in Christ! Hi! My husband and I just got back from the Camino a few days ago. When our plane landed in Madrid, I immediately began to develop a cold. Because I couldn’t really rest, I never got over it and it developed into a fever, bronchitis and sinus infection. All I craved was hot soup! So I ordered it whenever I could. As a result, I had ten bowls of Caldo Gallego during our days on the trail and got to try many different versions. I want to make some here at home to remember our Camino experience. 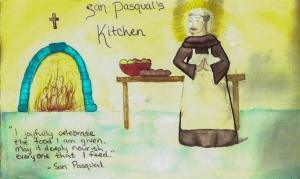 Thank you so much for your recipes, pictures, and faith expression. Would you be willing to share more about your Camino? I’m writing a book. Hola Peregrina! Thank you so much for your comment. It’s always good to meet another pilgrim. I would be happy to contribute.